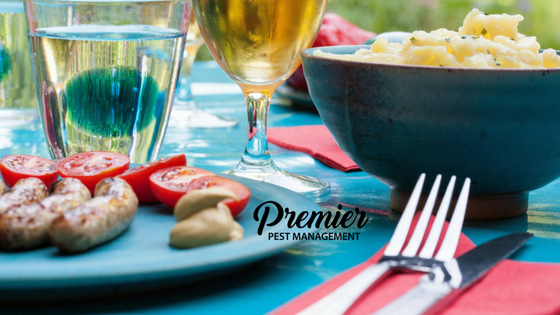 Keep Your BBQ Free of Pests this Summer with these Tips! > Blog > Uncategorized > Keep Your BBQ Free of Pests this Summer with these Tips! It’s backyard BBQ season here in Saskatchewan! Everyone wants nothing more than to kick back, enjoy a burger and some quality time with friends and family without being stung by a wasp or bitten by a mosquito. These simple tips will help to un-invite these unwanted guests from your party. Before the party check that your doors close securely. With a parade of people coming in and out, you need to be sure you’re not creating an ideal location for pests to enter your home. Also, check your screens for holes and repair any you may find. If you have room, serve your food and beverages indoors. These items are more likely to attract pests to your party. Check for water. If there is any standing water in the area where your party will be held, remove as much as possible. Birdbaths, pools, tire swings, etc. are perfect locations for mosquitoes to breed. Keep insect repellent on hand for you and your guests. It never hurts to buy it in bulk during the summer months! Wasps and other stinging insects love strong smelling shampoos, perfumes, lotions, etc. and it can encourage them to hang around. Give you guests a courtesy heads-up beforehand. Keep outdoor drinks in open containers to monitor for pests. Clear trash/recycling right away, or place bins away from the entertaining area. Both the trash and the recycling can be a warm invite for pests. After your meal is wrapped up you’ll probably be ready to take a load off and visit. If you’re tempted to let the dishware and utensils sit for a while, don’t. Take any dishes indoors and rinse them in the sink or use disposables. Avoid leaving empty cans and bottles laying around overnight. Be sure to empty your trash from the garbage can as well. These few simple tricks will make your backyard festivities much more enjoyable for you and your guests. If you’re having pest issues and need assistance, contact us in the Regina area today!